FANBOY PLANET.com . : ds-doctor-who-THE-MAGICIANS-APPRENTICE :. That Moffat! Who else would be so clever as to start off a new season with an RTD finale? The first time I saw this episode, I was almost certain the boy on the battlefield would reveal he was “Adolf Hitler.” And to all intents and purposes, he did. And just as there is really only one time-travel story involving Hitler*, there is only one time-travel story involving Davros. He is superfluous to “Destiny of the Daleks,” “Resurrection of the Daleks,” and “Remembrance of the Daleks,” any of which could easily have written him out. He is a tedious mouthpiece in “Journey’s End.” Only “Revelation of the Daleks” makes any dramatically interesting use of him, but it is not so much a Davros story as it is a story with Davros in it. 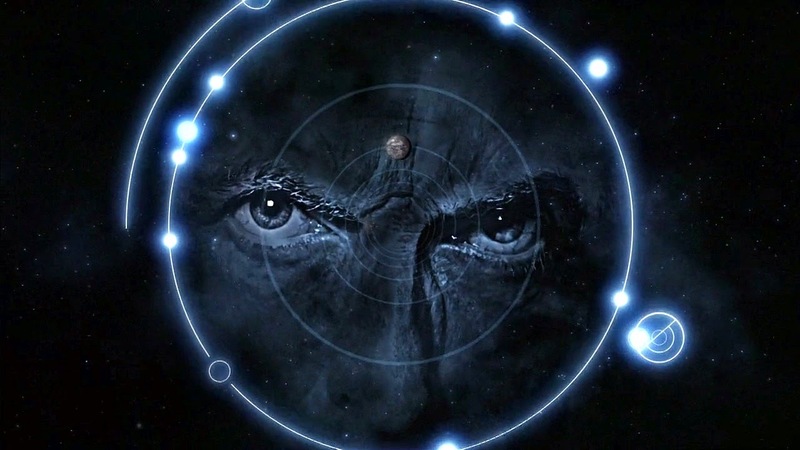 No: if you are going to do a Davros story, you are going to do THE Davros story, “Genesis of the Daleks.” That’s the only one that happens while Davros exists but the Daleks as an independent species do not, at least not in Episode One. That’s the one that asks: if you could stop one of the most evil forces in the universe from coming into being, but you would have to commit an evil act to do it, should you? In that story, which is quoted directly in “The Magician’s Apprentice,” the evil act is destroying a roomful of Kaled mutants destined for Dalek shells. In this one, the evil act is killing Davros himself as a child, or at least leaving him with a thousand-to-one chance of survival, and the decision is very much in the Doctor’s hands. It puts that moral question, the Doctor Who version of “if you had a time machine, would you go back and kill Hitler?”, in terms that require some resolution. Even if you’ve pondered this question many times in philosophy classrooms or late-night student lounge discussions, it’s a cinch that many viewers haven’t, particularly the young ones. So this should be gripping TV. And it is, but not because of Davros. Both actors playing him are fine, though compared to Michael Wisher in “Genesis” and Terry Molloy in “Revelation” I still think Julian Bleach is a poor third in the Davros steeplechase. It’s just that rather than being reminded of why this question even matters, refreshing our memories about the Daleks’ Naziesque atrocities, we’re presented instead with a threat to the Doctor’s TARDIS and his friends. Perhaps we’ve all seen so many Dalek stories by now, heard the Doctor play them up as the ultimate enemy so many times, that we don’t need reminding that they are a threat to the entire universe, but surely in a story like this, it wouldn’t hurt to throw in a few scenes of the Daleks occupying and sterilizing several planets, showing them as active, ongoing threats, not just personal foes. Maybe we’ll get some of that in the second part, now that it’s been revealed, in what can hardly have come as a shock to anyone, that Davros has some Daleks hanging around with him. So why is it gripping? In a word, Missy. She’s the best Master since Delgado, we’re all correctly saying. She might be the best Master, period, some of us are quite reasonably suspecting. She might still seem a little capricious, and a little too preoccupied with the Doctor himself rather than having any independent goals, but the discussion of her relationship with him is priceless. It does for Missy what “The Doctor’s Wife” does for the TARDIS. And Michelle Gomez doesn’t so much steal every scene as steal the entire show. 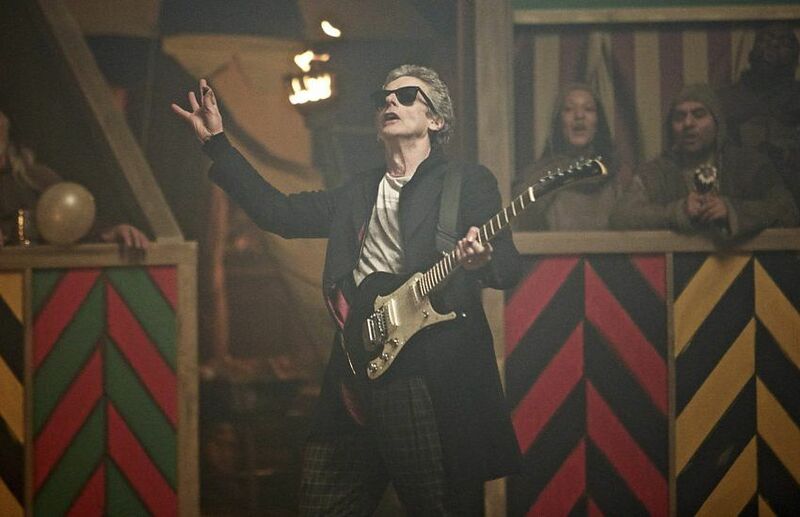 Capaldi, on the other hand, is saddled with playing a delicate balance in his biggest scene: he has to show us a Time Lord scared for his very life and hiding it with desperate attempts to be cool (the guitar), funny (the dad jokes), and cool/funny (the “dude” jokes). To give the scene the most possible credit is to assume it intended for the Doctor to seem nervous and dorky, not for the scene to seem nervous and dorky. Capaldi almost pulls it off. Then there’s Clara. I should love her: a companion with an independent life, a clever mind, an iron nerve, and a history of snogging Jane Austen. I still don’t. Perhaps she’s just too impossible. I keep forgetting Kate Stewart was even in the story. It’s as though Moffat, the directors, and the costume designers are going out of their way to make her forgettable every time she appears, and Redgrave has never had so little to work with as she does here. And then there’s Colony Sarff, as nervous and dorky a concept as the Doctor’s arena entrance. Perhaps in a different story he (I mean they) would fit, but here they just seem incongruous. The need to wheel in what looks like a roller-skating Skeletor henchman as an “intimidating” Davros catspaw underscores the fact that the Daleks are, time and again, just not menacing enough. I mean, we already know Davros is the key figure in this story. Would it spoil that much suspense to just have Daleks bust in on the Maldovarium, the Shadow Proclamation, and Karn? Why wouldn’t that be scarier? The answer is revealing: because the Daleks aren’t scary. We never see the pepperpots themselves being scary anymore. We need eyestalks popping out of people’s heads, humans turned into pigs, or an old scientist with a ruined face and a mechanical hand to make them seem scary. These are space Nazis, for goodness’ sake. It shouldn’t be hard for a Dalek to be the least cuddly creature in the universe. And yet even when it’s threatening to kill you, all you want to do is hug it. Ask Rose. * “What about ‘Let’s Kill Hitler,'” you’re asking? Exception proving the rule: our time team shoves him in a cupboard. The story goes out of its way NOT to involve him.